So you want to use a digital camera for your coin images? - Great idea! Although many people use scanners for imaging, many prefer cameras. If you are lucky enough to have access to a digital camera, you may be able to produce excellent images with a mere fraction of the editing work a scanner-produced image requires; perhaps with no editing at all! Your writer does not pretend to know about all the features and abilities of your particular digital camera, but reasonable images may be obtained with nearly any digital camera by following these suggestions. 1. Always use a tripod or camera-stand. It is nearly impossible to hold a camera steady enough to take a clear image of a coin - particularly when you are getting as close as your camera's focal length allows. I have included a picture of the home made camera-stand I use. 2. Get your lens as close to the coin as your camera will allow - "Fill the field" with the coin you are photographing. Many cameras have a close-up feature, sometimes called "Macro" - your camera may say something like "10X Macro" or "5X Macro" - this allows the object to be photographed very close to the lens. Turn off "Auto-Focus" if your camera allows you to do so, and focus manually. 4. Pay attention to the background against which you photograph. Since it is the coin that you are trying to show to best advantage, you need to pay attention to the background now so that it will distract as little as possible from the coin in the finished photograph. Many people prefer either a black or white background. 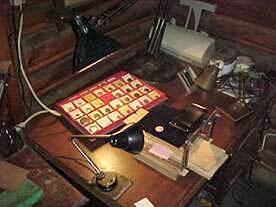 Some use red, some use a special "photographically neutral gray" sheet obtainable from photographic supply stores. What color you use is not as important as making sure the background is plain and does not have a pattern, dirt or debris that will ultimately distract from the image of the coin. 5. Use light to show your coin to best advantage. Lighting can make a big difference in how nice your resulting image is. I have achieved the best results using clear, rather than frosted light bulbs in "crane-arm" or gooseneck style desk lamps that permit them to be moved around and aimed. Turn off the camera's internal flash. Your primary light source should probably come from a point between "11:00 - 1:00", slightly off to the side to which the portrait faces for the obverse. For the reverse, the angle may vary depending on the design. You can (and should) experiment with the angle from which the light comes, but light should be aimed in such a way as to take advantage of the shadows cast by the devices, so a shallow angle above the plane of the coin is usually best. An additional lamp or lamps may be placed at 6:00 or 4:00 & 8:00 to eliminate shadows, but this is not necessary in all cases. Move your lamps nearer-in - or further back - to adjust the amount of light on the coin as you look though the viewfinder. Although many cameras have an "auto-focus" feature, it usually can be turned off - and should be. Manually focus the camera so that the coin's image is sharp - you won't be able to correct this adequately later. 7. Trust the image in the viewfinder - trust yourself, too! 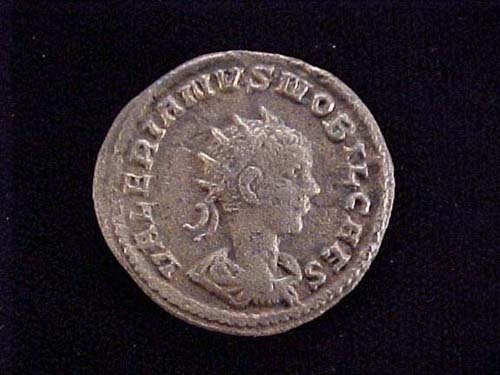 Remember, you are more familiar with this coin than anyone else in the world! You spent hours cleaning and researching it. When what you see in your viewfinder looks as much like your coin as possible - that is the time to press the shutter. Take as much time as necessary to be sure the lighting shows it to best advantage, focus carefully, but you are ultimately the expert on what it looks like - trust yourself! I have a background in theater and so approach coin-imaging like dressing a stage for a show - I call my home made jig a "photo-stage" and dress it with backgrounds and lighting - here's a picture of where I make my magic. 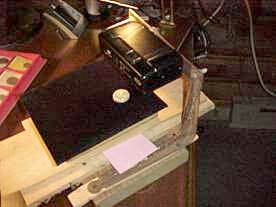 As you can see, my camera-stand was built from odds and ends of lumber and hardware - your set-up need not be expensive! A tripod works well too. I adjust the distance from coin to lens with boxes and shingle-shims. Straight from the camera, with no cropping or editing of any kind, whatsoever. Some people prefer to elevate the coin above the background with a dowel or Chapstick. If I had done so, the specks of dust on this background would have been out of focus. Some people elevate the coin on a piece of glass laid over an open-ended box to allow light below as well as above the coin - eliminating shadows caused by raising the coin. for editing your camera-generated images, if necessary or so-desired. Good Luck and Good Shootin'!